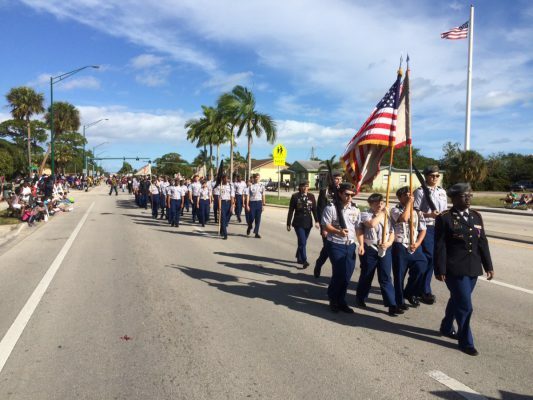 On Monday, January 16, Fort Pierce Westwood JROTC Battalion participated in the Martin Luther King, Jr. Parade in Fort Pierce, Florida. The Panther Color Guard also presented the national colors as they marched down Martin Luther King Blvd. A mass formation of cadets followed behind the Color Guard. They marched and shouted cadences exciting the crowd around them. Many Fort Pierce Westwood alumni and children shouted positive comments while the cadets marched. The Battalion endured many miles marching all while maintaining their military bearing. Parents, teachers, officials, and children were all impressed with the improvement the program has experienced over recent years.